GV Node delivers a broadcast-centric, real-time, distributed routing and IP processing node that supports IP and SDI workflows with vertically accurate switching and integrated video and audio processing, including Kaleido multiviewing for live production, playout and general purpose infrastructure. Up until now, there has not been an IP aggregation, processing and edge routing node designed for live production in broadcast, which can offer vertically accurate switching along with other signal processing and routing capability. With the introduction of GV Node, common off-the-shelf (COTS) IP switches can be used in broadcast and media facilities with the assurance that these switches offer transparent broadcast-centric operation and processing. GV Node is designed to handle deterministic vertically accurate switching within IP, supporting the suite of SMPTE ST 2110 or 2022-6 for IP inputs and outputs, with the option to provide Class-D ultra low latency SMPTE ST 2022-7 redundancy. The addition of isochronous and asynchronous support in SMPTE ST 2022-6 workflows provides a robust capacity to manage source timing variances. For full broadcast capabilities, GV Node also supports TICO visually lossless compression for 4K UHD applications, the extensive range of Densité signal processing modules, along with a fully integrated and highly scalable Kaleido multiviewer to deliver the highest quality monitoring with the most flexible layout available. In addition to modular cards from the Densité product line, GV Node also offer cards with specialized functions. IPG-4901 IP Gateway — Leveraging the full SMPTE ST 2022-7 Class A specification to ensure uninterrupted reception of high jitter signals with multi-mode or single-mode SFPs from software-based transmitters and remote sources up to 40 km. When using SMPTE ST 2022-7 compliant sources, the IPG-4901 can align redundant sources which are out of synchronization. In conjunction with the GV Node 40G aggregation ports, the IPG-4901 can convert SMPTE ST 2022-6 and AES67 signals from the WAN to SMPTE ST 2110-20/30/40 signals on the LAN. Each IPG-4901 module supports up six 3 Gb/s sources or nine HD sources with AES67 audio de-embedding and embedding. KMX-4921 Multiviewer — Supporting the same features and specifications as the earlier KMX-4911, the KMX-4921 multiviewer is SMPTE ST 2110-20 and SMPTE ST 2022-6 compliant and adds processing of high dynamic range (HDR) and wide color gamut (WCG) sources in HLG, PQ and S-Log3 HDR formats, and BT.2020 WCG. Each input is individually configurable, which allows to mix and match SDR and HDR sources, as well as different formats of HDR, on the same display. Requires KMX-4921-OPT-HDR license. Densité Signal Processing Modules — May be added to a GV Node frame. Note: One or two SFP options must be ordered for each IPG-4901. Other types of SFP Optical are available for this product. Please contact your local Grass Valley sales representative for more information. In addition to the new modules outlined above, GV Node can be fitted with existing Densité 3 RU/2 RU modules to provide a wide range of SDI processing capabilities. Multiple control options for the GV Node IP processing node include GV Convergent, NV9000, iControl or the RCP-200 panel. Enabling graceful broadcast-centric IP network scaling with a non-proprietary solution that supports vertically accurate switching. IP MEANS AGILITY. 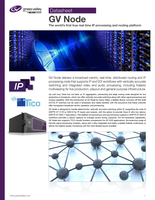 It's the number one reason broadcasters are even considering a migration from SDI to IP. With the agility of IP, broadcasters will be setup to handle the growing needs of their broadcast plant today and, perhaps even more importantly, their ability to continue expanding easily in the future is assured. The broadcast industry’s first Glass-to-Glass IP solution for production studios and broadcast operations centers has been introduced by Grass Valley, a Belden Brand. Our solutions are “Glass-to-Glass” because they offer video-over-IP connectivity (SMPTE 2022-6) across all the key stages of production, from acquisition to control room monitoring. This spans cameras, routing, gateways plus control and monitoring, along with servers, production switching and multiviewers. TICO 4:1 visually lossless compression is also supported in our cameras and production switchers to enable 4K in both SDI and IP infrastructures.